CENTRAL CITY, KY (WFIE) - Fire crews worked hours to contain a fire at a rubber mulch company right outside of Central City. This isn't the first time they've had a fire at Re-Tek. Last year, a fire destroyed one of the company's warehouses. Investigators ruled that blaze undetermined. Now, crews are seeing the same story play out at the company's other warehouse across the street. The fire broke out around 3:00 AM. Employees noticed the fire and called 9-1-1. When fire crews rounded the corner on Cleaton Rd, they knew they had a big job on their hands. "We try to compose ourselves and come up with a game plan of what's the best thing to," Captain for the Central City Fire Department, Brandon Divine, said. 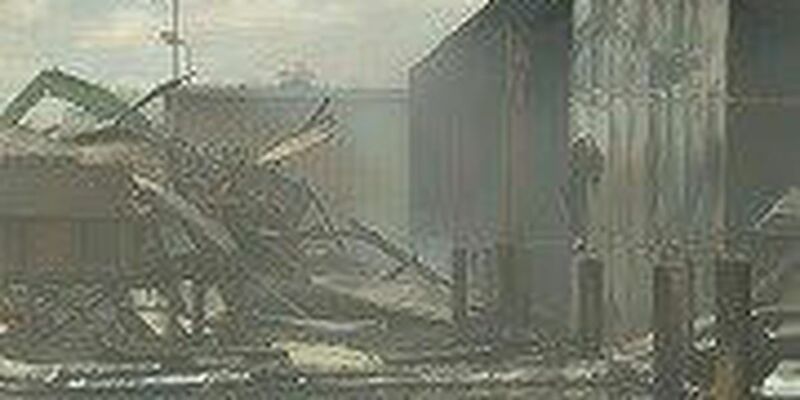 The Re-Tek warehouse was engulfed in flames. Crews spent all morning trying to control the fire, but the rubber mulch didn't help. "It's very hard to put out. It contains a lot of heat. A lot of times, it will spontaneously combust when it creates it own heat," Captain Divine said. 10 hours later, the mulch was still burning. Big fires don't happen often in this area, but when they do, Fire Chief Ricky King says the fire teams are prepared. "We have eight fire departments total in this county, and when we have something like this, we are all one. One team. And they pull together and are wonderful," Chief King said. Crews say they'll be working well into the night. They're glad no one was hurt but feel for the company that's now lost two buildings. "No lives were lost. The owner is very distraught, as would any business owner be, but you know we've talked and equipment can be replaced where human lives can't," Captain Divine said. Crews say the next step is to bring investigators in and determine the cause.